Summary: A fun fuzzy touch and feel book for little ones! Cute rhyming story that follows the little bees all around the barnyard and teaches animal sounds. This little craft has the potential to get a little…dare I say it…messy. Marker doesn’t always dry as well on the foam sheets, so little fingers *may* be a little black when the craft is done! But really, the bumblebee is so very cute, so a few smudgy fingers should be forgiven! Cut an uppercase 'B' out of the foam sheet or construction paper. I used a foam sheet that was about 4" x 5" in size. Cut out two circles from the wax paper to use as wings for your bee. Cut the pipecleaner into two pieces ~ one should be 1/3 of the length of the pipecleaner, the other 2/3 of the length. Poke the small pipecleaner through the bottom base of the 'B' to use as a 'stinger'. 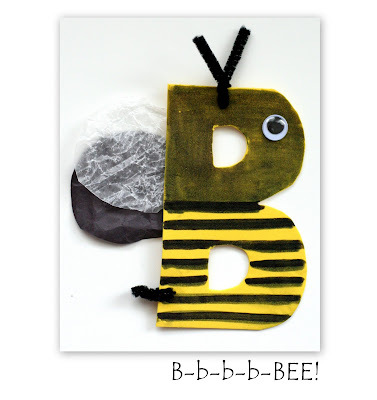 Poke the longer pipecleaner through the upper part of the 'B' to use as the bee's antennae. Have your child draw stripes on the B using the marker. Glue on the googly eye and wings. Cute! We're doing this today! We used dryer sheets for the wings and our bee really did smell good!